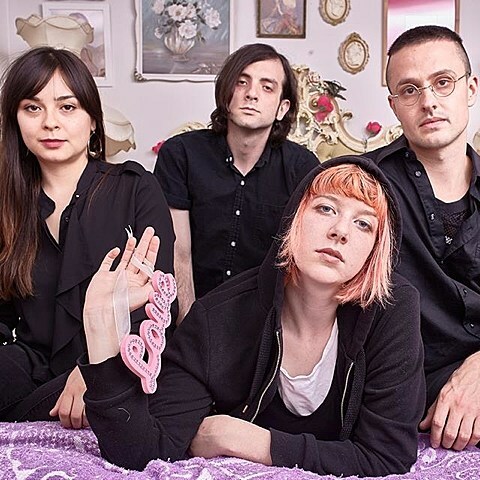 Toronto’s Dilly Dally quickly became one of the more exciting new indie rock bands of last year with their impressive singles and killer live show. Now they’ve signed to Partisan Records (Torres, Craig Finn) in the US and Buzz Records (Greys, The Beverleys) in Canada to release their debut album, Sore, on October 9. The album’s first single, “Desire,” does just what those early singles did best — re-imagine ’80s/’90s indie rock for the current era. It has bashing grungey guitars, Katie Monks’ voice is fiery and distinct, and it sounds fresh but also familiar (probably because it sounds quite a bit like the Pixies’ “Gigantic” at times). Listen, and check out the artwork and tracklist, below. The band also announced a tour with fellow Toronto distortion lovers METZ (no NYC stops though). Those dates are also listed below.